Buttered Beets with Arugula Add washed trimmed beets to cool water. Cook med. heat until tender. Drain, cool, peel skin. Slice 1/4 inch thick. In large pan, melt 1/2 stick unsalted butter. Add beets, saute til hot. 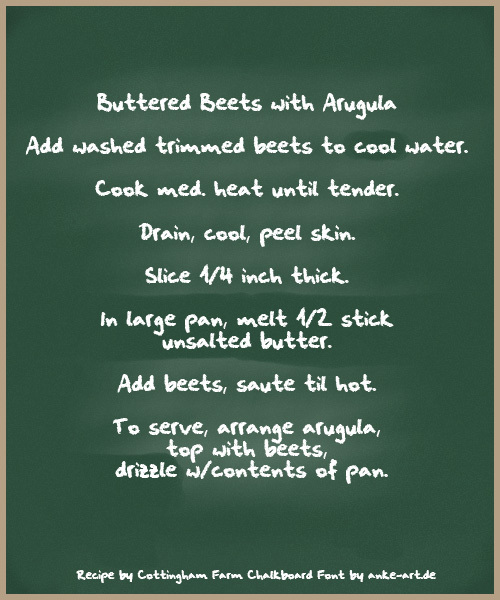 To serve, arrange arugula, top with beets, drizzle w/contents of pan.